One of the most brilliant things about The Office -- and there are many -- are the facial expressions. We're all familiar with Jim's famous quizzical camera face, Angela's glare, Kevin's grin, and Stanley's constant eyerolls. But more incredible are the facial expressions of all of these characters when we're not looking. Pick an episode, any episode, and watch it all the way through, focusing only on Michael. You'll notice that he looks at the camera at least every 10 seconds, in a different way each time. He's looking for something from whoever is behind the camera, usually an affirmation for some fact he invented or a laugh to a joke that's (not) funny. Luckily for Michael, the person he's looking at behind the camera -- you -- is cracking the hell up. While Michael is by far my favorite face-maker (Facemaker! who remembers that game? ), there are plenty of face superstars on The Office. 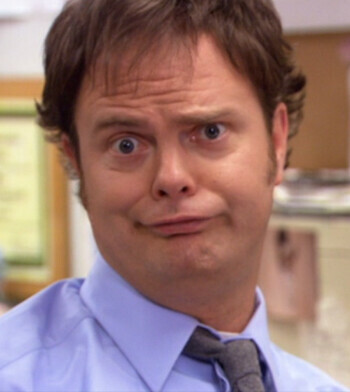 One of my all-time favorite faces is a Dwight original. Just after having driven into the lake, soaking wet, when Michael is freaking out (literally) about the guy who ate his chocolate turtles, the camera flashes to Dwigt (d-w-i-g-H-t) for just a millisecond, and the look on Dwight's face is absolutely amazing...and impossible to reproduce (I've tried. Many times). In any case, no matter how much a blatant That's What She Said might appear to be the best moment in any given episode (and it's hard not to agree), the next time you re-watch all 4 seasons on DVD, keep an eye out for the smaller things. Michael Scott is not one for subtlety, but luckily for us, Steve Carrell is.